This recently opened neighbourhood Kosher restaurant under Kedassia supervision offers a brand new menu of your favourite Heimishe dishes in spacious and welcoming surroundings. Favourites include Chicken Soup, Chopped Liver Pate, Fried Gefilte Fish and Salt Beef and International dishes including Beef Bourguignon, Roast Duck and a selection of meats from the grill. 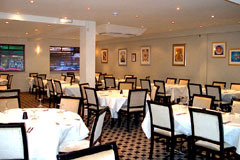 This is an ideal venue whether for a dinner for two, family get-together, business lunch or party or celebration – we have seating for up to 120 guests. Open Sun-Thur noon-2.30pm and 6-10.30pm, Sun open 2 hours after Shablah. All major credit cards accepted (not Amex/Diners). 12.5% service charge. In determining whether or not to eat kosher, bear in mind the basic concepts i.e. no mixing of dairy and meat; no pork or pork products or shellfish.